The Hart Law Firm is proud to introduce Unbundled Legal Services for our Family Law clients. Since we first opened our law practice back in 2005, our primary goal has always been to develop close and personal relationships with all of our clients. During the past few years, our practice has seen a lot of growth, and as such, we have had to turn many clients away and raise our fees accordingly. But something about this approach never felt right to me. I’ve always enjoyed helping people who need the most help… people who are victims and being held captive in their marriage. Unfortunately, it is often these very people who can least afford our services. At The Hart Law Firm, we want to make legal services more accessible to the public, and help more people as opposed to restricting access to our firm. Unbundled legal services will allow us to do that. That is soon going to change. In the coming months, there are going to be major changes to the way we help our clients. Instead of requiring every client to pay a hefty minimum fee to retain our firm (typically between $5,000 and $10,000), we will be offering unbundled or limited scope legal services for our family law clients. Fees for this service will typically start around $500-$2,500. In the sections that follow, I will touch briefly on what unbundled legal services are, how you can save money by hiring an unbundled family law attorney, and whether or not your case is appropriate for unbundled legal services. 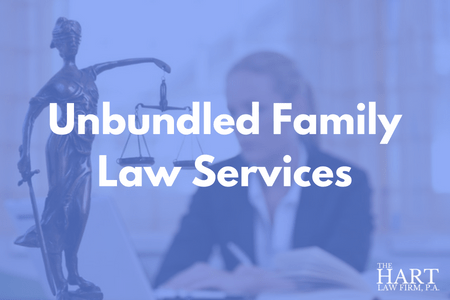 What Types of Unbundled Legal Services can a Family Law Firm provide? How Can You Save Money with Unbundled Family Law Services? What is Unbundled Family Law Coaching? Should You Use and Unbundled Attorney for Your Family Law Case? Before I tell you what unbundled legal services are, let me tell you what they aren’t. Unbundled legal services are NOT the same as “full service representation”. Full service representation is the traditional business model for many attorneys where a client hires the firm to serve as their lawyer, pays a large fee, and then the lawyer handles all aspects of the case. Unbundled legal services (also known as limited scope representation) is the opposite of full service representation. And this is basically the perfect definition. When you hire an unbundled family lawyer, you are limiting the amount of work that lawyer will do for you, and you are responsible for everything else. Basically, we can provide the “legal muscle” you need on a limited scope so that you can handle everything else. When you hire a family law attorney for unbundled or limited scope representation, you are hiring the lawyer to do a discrete task that you, as a layperson, cannot do. Typically the activities that we are asked to do are services that only a lawyer can do, or at the very least is best positioned to do. A good example of this is writing a letter on behalf of a client. A family lawyer is trained to identify the strengths and weaknesses of your case from a legal standpoint. When we write a letter on your behalf, we can do so in a way that is persuasive and more likely to get a result than if you draft a letter on your own. For a variety of reasons, many lawyers will very rarely talk to opposing parties that do not have a lawyer. If you hire us to draft a letter on your behalf, the letter will frequently have more “pull” than if you drafted the letter yourself. In addition, whenever we draft a letter for a client to another lawyer, we will follow that letter up with a phone call to the other lawyer. By simply talking to the lawyer for your spouse, we can often the issues that are really driving the conflict in your case and help guide you in a way that is most likely to lead to a settlement. These are things that you are unable to do if you represent yourself. Abraham Lincoln once said, “if you represent yourself, you have a fool for a client.” And this couldn’t be more true in situations where you are attempting to communicate with a lawyer who represents your spouse. One of the unbundled services we provide to family law clients is divorce coaching. The purposed of this service is to help you negotiate a proper and fair resolution to your case. As a practicing family lawyer for over 13 years, I’ve seen the good, the bad, and the ugly in family law cases. I’ve been in front of all the judges in Wake County. I have a pretty good feel for how a case will resolve if you end up in court. With divorce coaching, I can use my experience as a family lawyer to help you reach a resolution that is fair and reasonable to you. When I see an offer from another attorney or a pro se spouse, I can quickly identify the possible issues and whether or not your spouse is being reasonable. Whether your spouse is or isn’t being reasonable, I can coach you about how to properly negotiate your case, and if you can’t reach a resolution, we can discuss the things you need to do to properly prepare your case for a hearing or trial. Not every case is a good fit for unbundled services. Some cases have too many issues, are too emotional, or there is too much money at stake for you to not have a full service lawyer representing you. In those cases, the $20,000 to $30,000 you may pay on legal fees is a good investment because attempting to represent yourself could cost you significantly more than that. However, in cases where the issues are simple, or you would rather not pay $5,000 to $10,000 in up front legal fees, then unbundled services may be a good fit. If you have any questions, or would like to talk to a lawyer about how you may benefit from unbundled family law help, then you can give us a call at (919) 883-4861 or fill our our contact form and schedule a time to talk to us that is convenient for you.